Clarke was born in Leicester, the son of prominent local surgeon Julius St. Thomas Clarke, MD, MS, FRCS. He spent most of his life in Leicester, though he also had a house in Lyddington, Rutland, in his later years and retirement. He was educated at the Wyggeston and Oakham Schools, Caius College, Cambridge (BA Natural Sciences Tripos, 1892) followed by the clinical course at Guy’s Hospital (MB BCh in 1895), and he later gained his MD Cantab. in 1898. After a year a house-physician at Guy’s and some postgraduate study abroad he returned to Leicester and established his own medical practice in in 1896, soon afterwards being appointed an Honorary Consulting Physician and Consulting Radiologist to the Leicester Royal Infirmary, holding the office until 1930. He was an active service member of the Leicestershire and Rutland Territorial Association from 1910 to 1925 and was already a Lt. Colonel in the Royal Army Medical Corps reserve at the outbreak of World War I in August 1914. He was immediately appointed to the North Midland Division of the Army Medical Service, becoming a full Colonel as Administrator of the military’s 5th Northern General Hospital in the former County Lunatic Asylum building, Leicester (now the Fielding Johnson Building of Leicester University). Post-war medical appointments included the position of Honorary Consulting Physician for the East Midlands Region for the Ministry of Pensions, Medical Director of the Pensions Ministry’s Frith Home of Recovery for Neurasthenia and Chairman of the Leicester General Hospital. He was an active member of the British Medical Association for almost fifty years holding many positions both locally and nationally and he was also President of the Leicester Medical Society in 1911 and was made an Officer of the Order of St. John of Jerusalem by the King in 1930. He joined the Lit. and Phil. in 1901, and in 1912 gave what is almost certainly the most important and influential Presidential Address in the Society’s 175 year history. In this he took up and carried much further the calls of his predecessors Rev. Joseph Wood in 1880 and Rev. James Went in 1885 for the establishment of university level education in Leicester. Clarke put it to the Society and the Borough more generally: “Do we [i.e. Leicester] desire any position than the top?” He continued: “I look forward to the time when Leicester will not be content without some University College in its midst, where the various branches of knowledge will have a fitting home, and the Institution may be part of Leicester’s daily life.” He continued by pointing out that earlier in the year 25 Wyggeston Boys had passed the equivalent of Matriculation and therefore were eligible to proceed to University, but in the absence of anywhere local to attend many may not in fact proceed to higher education. Pointing out that his own academic and medical education had had to be in Cambridge and London he expressed the hope that one day the proposed university would provide medical education for local medical students as well. The outbreak of World War I prevented much progress being made with the practical efforts such as fund-raising, but on 14th November 1917 the Leicester Daily Post argued that rather than construct ‘artistic memorials’ at the end of the War the main Leicester and Leicestershire War Memorial should be a University College. It also suggested that the old County Asylum Building (then in use as a temporary military hospital and under Col. Astley Clarke’s direction) should be used for the University College. 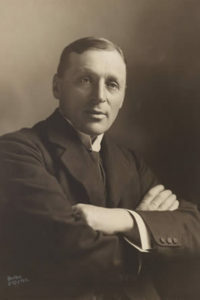 The County Council’s Director of Education, William Brockington (an influential Member of the Lit. and Phil. who had been President in 1909-10) wrote a strong letter of support to the newspaper. In March 1918 the Mayor, Alderman Jonathan North, called a meeting to gauge and promote support for the proposal, which was attended by Clarke, Dr. F.W. Bennett, James Went and Harry Hardy Peach (all past or future Lit. and Phil. Presidents) on behalf of the Society. At the meeting Clarke made the first offer to start off an appeal for this purpose – the sum of £100 – to which Bennett added £500: by January 1920 the appeal had raised £100,000. In addition the elderly local textile manufacturer Thomas Fielding Johnson (a member of the Unitarian Great Meeting) had by then bought the old asylum building (now Leicester University’s Fielding Johnson Building) and a site of 37 acres and donated this for the use of the proposed University College. Thus opened and accepted its first students in 1921, with Clarke as the Vice-President of the College and the first Chairman of its governing Council, and he is today commemorated in the name of the building just in front of the original asylum building of the Leicester University campus. Clarke was also very active in public life, serving as a Justice of the Peace from 1921, a Deputy Lieutenant of the County of Leicester from 1928, a City Council Alderman from 1941 and Sheriff of Rutland in 1942. He also had a life-long interest in local history, writing a History of Lyddington in 1936, and building up a large and notable collection agricultural and household village antiquities. Presidential Address: Astley Clarke Presidential Address Transactions of LLPS Vol.17 (1913), pp. 5 – 23. Sources: Clarke, Astley Vavasour Who’s Who in Leicestershire (Worcester: Bayliss, 1935); Clarke, Astley Vavasour Who was Who 1920 – 2008 (Online edition: Oxford University Press 2009); Obituary: Astley V. Clarke M.D. British Medical Journal 3 March 1945, pp. 312-3.